Please read the following instructions carefully:To be able to order online without the need of a sales representative calling we need to ask a few simple questions and take a few measurements. 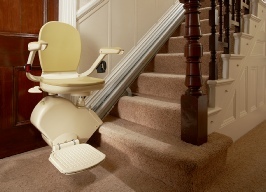 If it turns out there are any complications because of the layout of your stairs, or the needs of the user, do not worry, it does not mean a stairlift can not be fitted but we will need to send a surveyor to assess and quote you on the product you require. 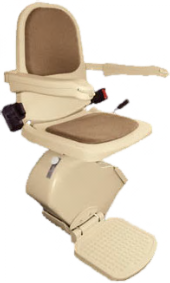 If you can answer yes to all the following questions we can install a new Acorn “Brooks Branded” stairlift for £1395.00. An engineer will install the lift in just under a hour. There is absolutely no mess when fitting as the rail is fitted to the stairs not the wall. If you need any assistance please call free on 0800 977 4686 and one of our engineers will be pleased to assist you in answering the questions. 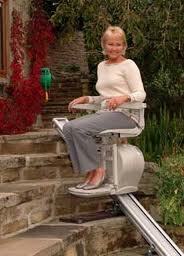 Is your staircase straight without any bends or landings between flights of steps or a fan at the top of the stairs? 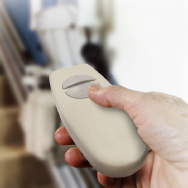 Do you have a power point within 3 metres of the top or bottom of your stairs? Is the height from the stairs to your bulkhead at least 1.75 metres? Can the user sit without the need for lateral support? Can the user bend his or her legs as required in a seating position? Does the user have the capacity to operate the lift? If there is a door on the side the stairlift will be fitted, is there at least 250 mm between the bottom of the stairs and the door frame? Is there at least 600 mm from the bottom of the stairs to the nearest wall opposite the bottom of the stairs? Bearing in mind the rail length you will measure as explained below and adding temporarily at least 250mm to be safe, will there be any access issues getting the rail onto the stairs from the front, back or side door? If so we can supply a jointed rail, that will reduce the size to half to enable easier access. We need one last piece of information. Please take this measurement by running a measuring tape down the stairs from the top nose until it touches the floor at the bottom. It’s the measurement shown in the diagram with the dotted line. This is the rail length. If you can answer “Yes” to all the above questions and have taken the above measurement then please proceed to our secure online shop to order your stairlift online for £1395. The order section is at the bottom of the page you will be transferred to. Thank you. Please note: It is important that the rail length measurement is correct and all the other measurements asked for are checked carefully otherwise an additional charge would have to be made if we had to return if the rail length is wrong or there is an access issue. Of course, if you wish to have a surveyor call and check the measurements the fixed standard price is £1595.00 for a straight stairlift and you would have complete piece of mind too. The choice is yours. Feel free to call if you have any concerns. Once you have placed your order an engineer will call to confirm all the measurements with you. **Please also note: The lift we supply is the Acorn “Brooks branded” lift that is brown and cream in colour as seen to the right. It is a more neutral colour than the Acorn branded grey and red.